This large room located on the second level historic side is a favorite with its eye-popping bittersweet walls, original skeleton key lock. 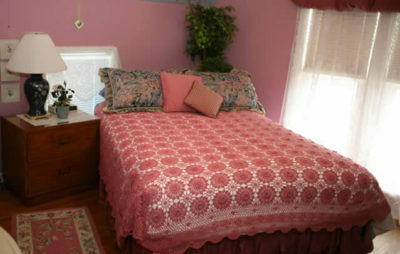 It features a comfortable King-sized iron frame bed with a removable feather mattress. The full-mantled electric fireplace with two upholstered chairs makes a cozy spot to read or just to be together. Large floor-to-ceiling windows face North, with a smaller window overlooking Tawas Bay. In-room amenities include a flat-screen cable TV, a full-length mirror in the lighted closet, ceiling fan, central air, a full bath with tub and shower, toiletries and a hair dryer. A small Service Area, with refrigerator and Keurig coffeemaker, is available in the hallway. 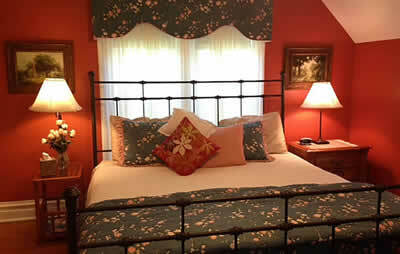 Nestle in to this comfortable room on the second level historic side and enjoy the great view of Tawas Bay. The Robin’s Nest is decorated in soothing tones of soft rose, with maroon & blue accents. You’ll love the Queen-sized bed with a removable feather mattress, decorative electric fireplace, a large upholstered wing chair, the large floor-to-ceiling windows overlooking Tawas Bay and hardwood floors. 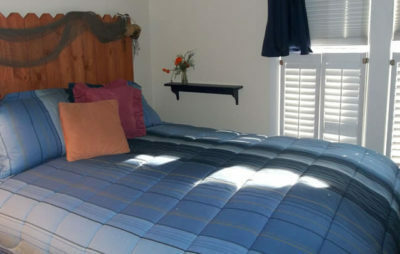 Amenities include a flat-screen cable TV, a full-length mirror in the lighted closet, ceiling fan, central air, private bath with shower, toiletries and hair dryer a few steps outside the room. A small Service Area with refrigerator and Keurig coffeemaker is available in the hall. 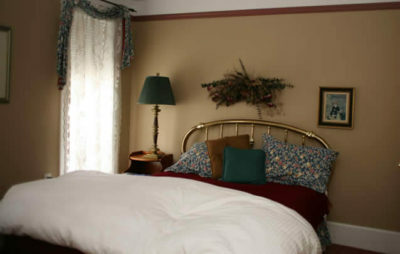 You will have sweet dreams in this small but delightful room on the second floor of the historic side. Cozy and intimate with the warmth of creamy walls, soft green trim, pumpkin and dark blue purple accents, hardwood floors, and the magnificent oil painting of docked sailboats gently rocking in the moonlight. 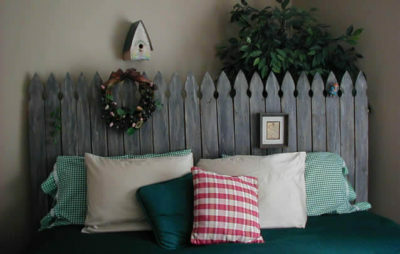 A stained wood fence headboard supports the queen-sized bed with removable feather mattress. A small electric oil radiator keeps you cozy and the small painted antique frame chair adds the perfect finishing touch. Two large floor-to-ceiling windows overlook our well maintained parking lot & deck bringing ample light into the room. 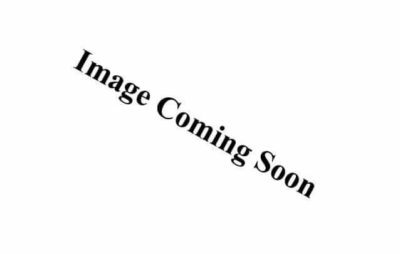 The Sail Away room’s amenities include a flat screen cable TV, a large rectangular mirror, clothing hooks on the wall, central air, ceiling fan, attached bath with shower, toiletries and a hair dryer. A small Service Area with a refrigerator and a Keurig coffeemaker is available in the hall. Il Giardino located on the main floor in the new addition, was inspired by a lovely garden of brilliant flowers along a weathered stockade fence – An eye-popping contrast! When Ralph Lauren introduced a bright floral bedding collection, the die was cast. Yield to the intoxicating fragrances. The private entrance from the furnished deck lends an easy transition from evening nightcap on the deck, just a few steps away, to the comfy feather mattress on the king-sized bed with its weathered stockade fence headboard. Two large floor-to-ceiling windows facing the Bay, along with a decorative electric fireplace and two padded chairs flanking a bird bath glass topped table make the Garden room a delightful retreat that is also accessible to those with limited disability. Amenities include central air, ceiling fan, flat-screen cable TV, a full bath with tub and shower with grab bars, toiletries, a hair dryer and best of all – a private entrance off the deck facing the Bay. The soft golden hued walls with maroon trim and blue accents and rose-colored carpet lend a quiet and peaceful effect to this traditionally furnished room located on the main floor in the new addition. A polished brass headboard supporting the queen-sized bed, with a removable feather mattress, envelopes you in comfort. The upholstered antique mahogany wood-frame chair and brass-footed footstool offer a quiet resting place. Two floor-to-ceiling windows face the outdoor landscape. In-room amenities include a flat-screen cable TV, a full-length mirror, central air, ceiling fan and a private bath with shower, grab bars, toiletries and hairdryer. A small refrigerator is located outside the room for your convenience. Located on the second floor of the new edition this recently redecorated room boasts deep turquoise carpeting and red and turquoise print bedspreads and window treatments, crisp white walls and wood shutters. The Loft features twin beds a desk and a recliner. This room is rented only in conjunction with Piacere, directly below, where the bath can be shared by other family members, gal pals or guy pals. We are not equipped to accommodate pets. Check in from 3 p.m. to 9 p.m. unless by prior arrangement. Check out at 11 a.m.
A two-night minimum stay is required on summer, weekends and Holidays. However, should there be prior reservation configurations that do not include a Friday or a Saturday,a one night accommodation may be available. Please call to verify. A 50% deposit of the total reservation is required at the time of your booking. A cancellation 2 weeks before the date of your arrival forfeits your 50% deposit. A cancellation 24 hours before your arrival date makes you responsible for the full amount of your reservation unless we are able to rebook the room, in which case, would result in a $50 cancellation fee. Weddings, Showers, Red Hats, Birthday Parties, Reunions, Bible Study Retreats as well as special interest groups (books, cooking, writing, wine tastings, poetry, music). Table games, cards and puzzles are available. Call to discuss your plans for your occasions or functions.